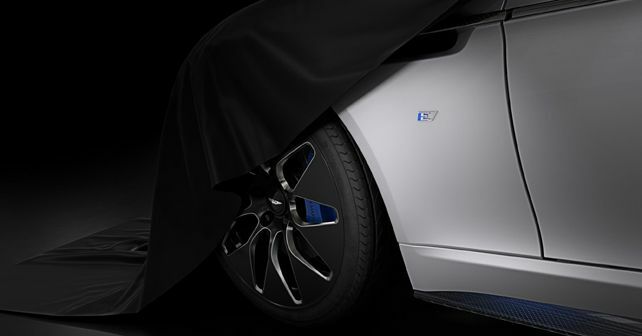 The limited-production Rapide E will mark Aston Martin's entry into the EV segment; aims to match the standard Rapide S in terms of performance. Aston Martin has pulled the covers off its first-ever BEV (Battery Electric Vehicle), the Rapide E. Developed in association with Williams Advanced Engineering, the Rapide E will be powered by two electric motors, giving the car a total power output of close to 602bhp and a maniacal torque figure of 950Nm! To put things into comparison, the standard Rapide S produces 552bhp and 630Nm of torque. Thus, the Rapide E will be the most powerful iteration of the Rapide model line produced to date. The Rapide E will be produced in the standard four-door configuration, however, it will see a limited production run of just 155 units. Powering the rear-mounted twin-electric motors will be a bespoke 800V battery pack, constructed using over 5600 lithium-ion cylindrical cells, which will sit where the original 6.0-litre V12, along with the gearbox and fuel tank, were located. This placement will also keep the overall weight distribution in check. The Rapide E's WLTP (Worldwide Harmonised Light Vehicle Test Procedure) range target is said to be over 321 kilometres while an hour of charging through a regular 400V charger can give it enough juice to run nearly 298km. To make the Rapide E more aerodynamically efficient than the Rapide S, both the car's exterior and underbody have been given a makeover from an EV development viewpoint and the low-rolling-resistance Pirelli P-Zero tires even feature noise-cancelling foam inside them. The Rapide E will be produced at Aston Martin's new St. Athan facility and the first international deliveries are slated to begin in the fourth quarter of 2019.